We’re entering the new year with a new browser and hope you are as excited about it as we already are. Opera 50, our milestone round edition, comes with an innovative anti-Bitcoin mining tool, extended VR360 support for Oculus, Chromecast and a bunch of other cool features. Everyone is talking about Bitcoins these days. Their sudden rise in value resulted in the fact that more and more people set out to mine them by running shady scripts on the PCs of unsuspecting users. This situation might sound familiar: your CPU is suddenly working at 100 percent capacity, the fan is going crazy for seemingly no reason and your battery is quickly depleting. These are signs someone might be using your computer to mine for cryptocurrency and can continue to do so even after you have left the site. It’s a problem which affects approximately 500 million people worldwide but not for those who choose Opera 50. We, as the only major browser with an integrated ad blocker, have a built-in solution to keep miners from trespassing onto your machine. After we recently updated the rules of our built-in ad blocker mechanism, we eliminated cryptocurrency mining scripts that overuse your device’s computing ability. 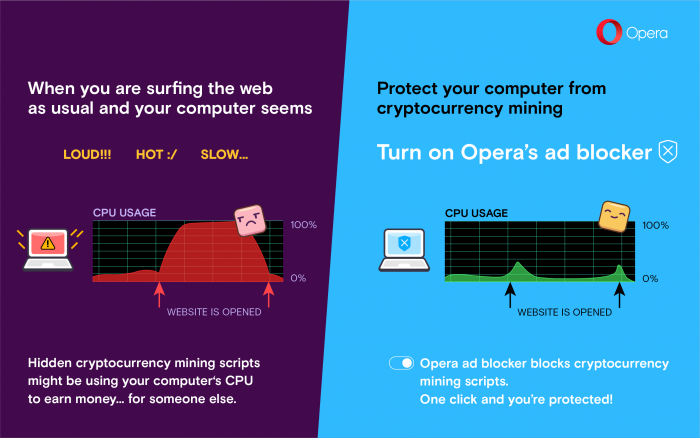 To prevent cryptocurrency mining sites from doing their dirty work on your computer, simply enable Opera’s ad blocker. 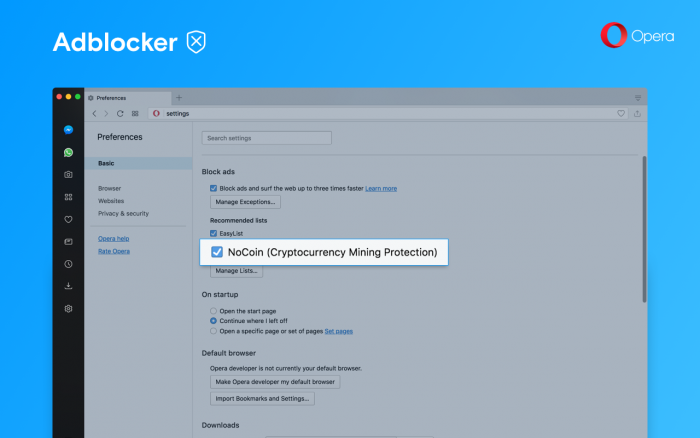 You can also find and change NoCoin in Settings (Preferences on macOS) > Basic > Block ads, under the Recommended lists of ad filters. If you like ads but still want to be protected from Bitcoin-mining, you can simply uncheck EasyList and leave the NoCoin box checked. Voilà – you’re protected. 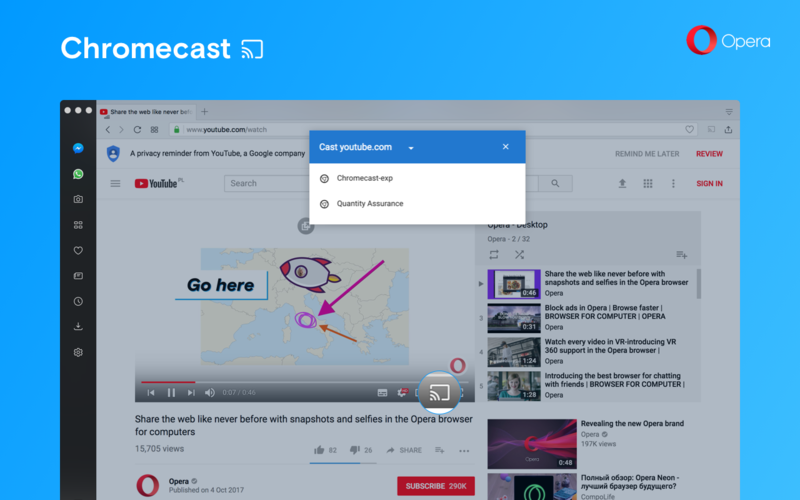 Chromecast is the device that helps you effortlessly stream content from your browser to your TV screen or home audio system without having to connect annoying cables each time. Google recently revealed that it has sold 55 million units since releasing the device in July 2013. For your convenience, Opera 50 now supports Chromecast playback. Opening the page’s context menu or opening the O-Menu (View on macOS) are alternative ways to begin casting. Opera 50 comes with a bunch of changes that allow you to enjoy VR content on the web even more. 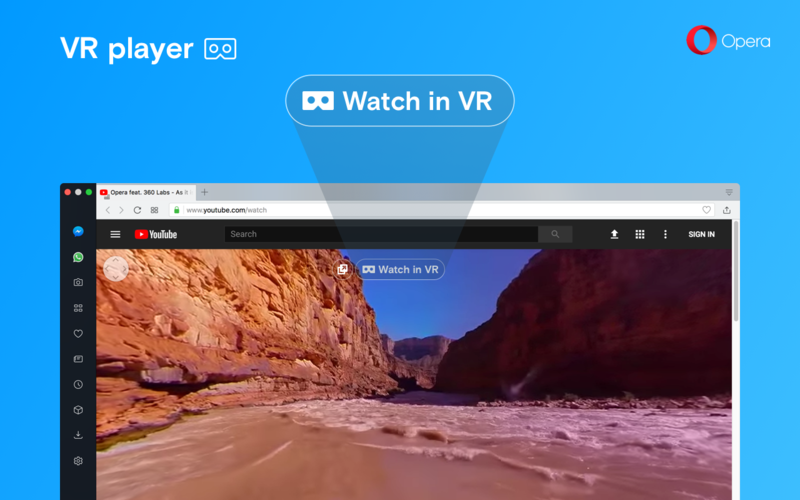 We started working on the VR Player for Opera to offer the immersive, 360-degree virtual world to our users just with one click. We started with OpenVR support, but now through work with Oculus, we are proud to announce that Oculus Rift support will be enabled with Opera 50. Oculus Rift has been an incredible milestone in the virtual reality world and it’s our pleasure to announce that Rift headset owners can now enjoy the Opera VR Player directly. 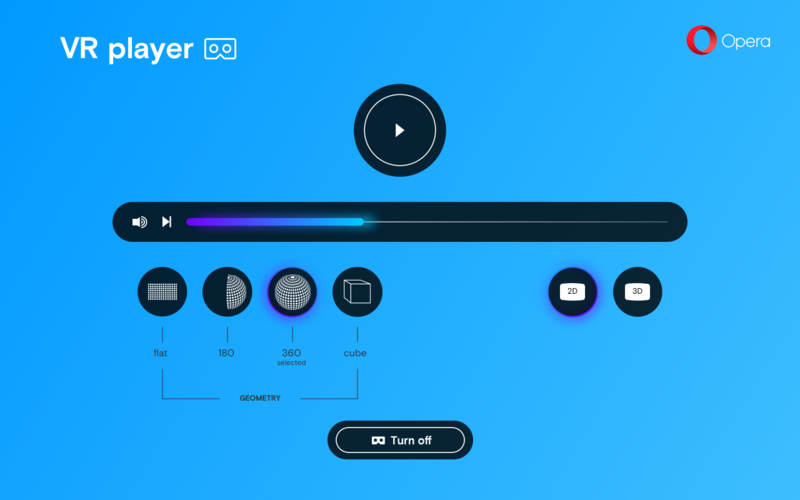 In our initial VR 360 Player release, we listed some tips and tricks a user might need to deal with some VR-related scenarios, such as using the VR Player when their GPU does not support YouTube’s VP8 or VP9 formats. But now, we have implemented software decoding path support in our code, so that you don’t need to install any extensions to handle it for you. It’s a very significant change that allows more users to enjoy VR online. Virtual reality is very young and still very undefined territory. A consequence of this is that there is no support in video containers to carry VR video metadata, such as format or stereoscopy mode. There are currently quite a few combinations of metadata available. We share a passion for VR and know it’s sometimes hard to stop. Still, we realized a dedicated Exit VR button was needed since users, while enjoying VR, are removed from the browser interface and it might be unclear how to properly stop VR playback. By clicking the “Turn off” button in the Opera VR 360 Player, your device will return to its native home screen. 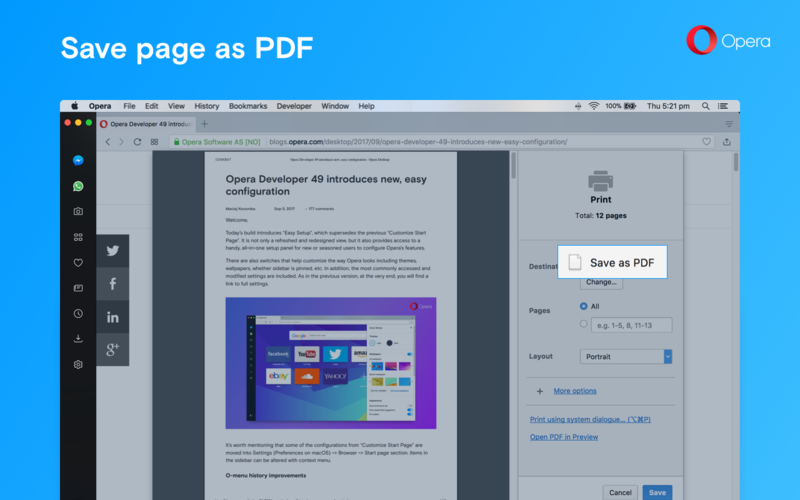 Storing a page to read offline later, sending it to other devices or saving it for future reference can now be done with the Save Page as PDF function. To save a page as a PDF file, go to the O-Menu (or File on macOS) and select “Save Page as PDF.” When triggered, it will save the entire web page as a single PDF. A shortcut can be created for this function under Settings (Preferences on macOS) > Browser > Shortcuts > Configure Shortcuts. The created file will take advantage of PDF capabilities, which means it will be smaller than a plain screenshot stored in PNG format and you’ll be able to select and copy the text. margins and so on. This is the best option if you intend to print it later. What are the differences between these two methods? Our new Save Page as PDF option will store exactly what you see on your screen. It’s great for reading offline, sharing pages or keeping them on your drive for future reference. The printing method will ask for the page to layout itself in a printer-friendly way. As a result, you may get something different from what you see on the screen. We have cleaned up and regrouped the items in the tab’s context menu into related sections while giving them new actions. Reopening closed tabs and windows is now easier with the “Reopen Last Closed Tab” button moved to the bottom. The option can change to “Reopen Last Closed Window” (for Windows and Linux platforms) if a full window was the last thing to be closed. 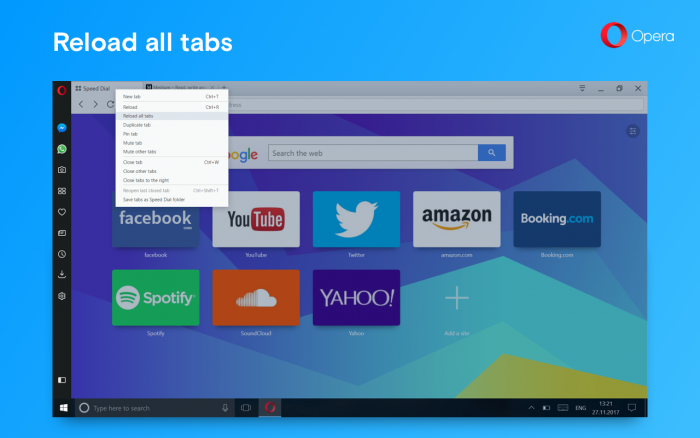 “Reload” and “Reload All Tabs” are two new functions to quickly refresh your current browsing session. The latter will ask for you to confirm the action if you have more than 10 tabs open. To choose your default currency which highlighted currencies will be converted to, go to Settings (Preferences on macOS) > Browser > User interface and select the currency from the “On text selection convert currency to” dropdown menu. 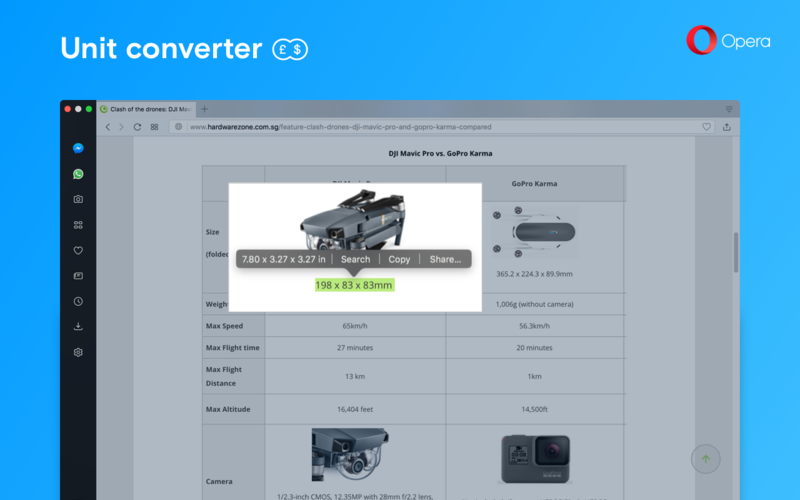 Today, our unit converter, which lets you convert units from, for example, kilograms to pounds or meters to feet while you are on any given page, becomes even better as we’ve added support for millimeters [mm] to be converted into inches [in]. In addition, there’s also support for dimensions. This means you’ll be able to convert the dimensions of a 10 x 10in picture frame or a 10 x 50 x 25 mm collectible toy car while you browse. Upon a crash loop detection, Opera 50 will not remove your current browsing session. Instead, all pages will be marked for manual reload after re-activation, except for the current tab which will detail the encountered problem. This will fix the annoying issue of losing all opened tabs due to an unrelated problem such as with syncing, for instance. In September 2016, we introduced the free, built-in, no-log browser VPN service. Opera remains the only major browser providing such a unique service. Now, we are introducing our first major upgrade to the browser VPN service. Previously, the VPN service was hosted and operated by SurfEasy LLC. We have, however, investigated the best options for hosting the service and concluded the browser VPN service will be moved to our own data centers. Opera’s current server infrastructure, one of the highest capacity super-computer clusters in the world, is already hosting services such as the compressing engine for Opera Mini. The colocation of the browser VPN service to our data centers gives increased performance, scalability and balancing capabilities, while keeping it a free and no-log service. As we moved the service to the Opera data centers, we also changed it from listing locations based on countries to regions. 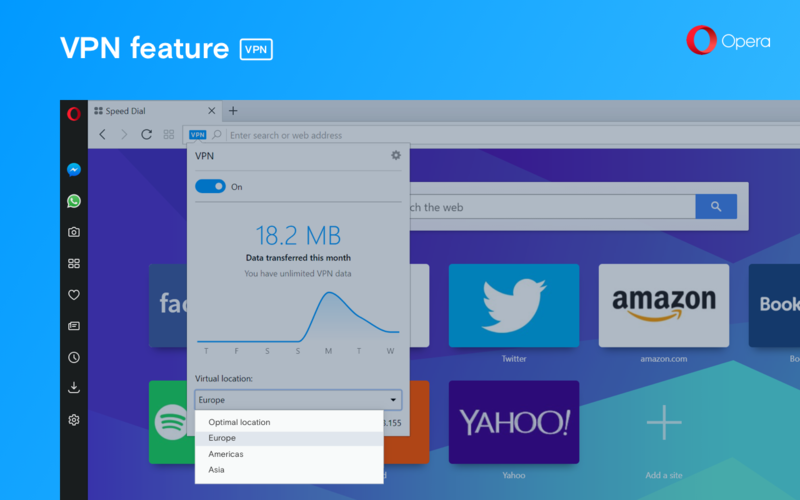 For the updated browser VPN, we provide these options: Optimal location (default), the Americas, Europe and Asia. Locations will be rolled out gradually. As the usage of the free browser VPN service keeps growing, we have also noticed people complaining about the quality of search results when having the VPN service enabled. When massive traffic goes through certain IP ranges, search engines tend to classify it to a certain area. As a result, you might get all your search results in Ukrainian or Dutch, for example, and languages can again change unexpectedly. Until now, this has been a problem for most VPN services. Since search quality is such an integral part of the browsing experience, we have decided to resolve it through the “local search” feature. 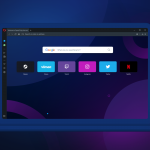 By default, the Opera browser will now bypass the browser VPN when you use your native search engines, such as Google, Bing or Yandex. These connections will still be secure over Secure Sockets Layer (SSL), but your local IP will be made visible to the search engines. When you click on links to navigate away from the search engines, the browser VPN service will automatically be re-enabled. We believe it’s a smart balance between absolute privacy and user comfort. People can also browse with the “local search” feature turned off by simply using a private browsing window. 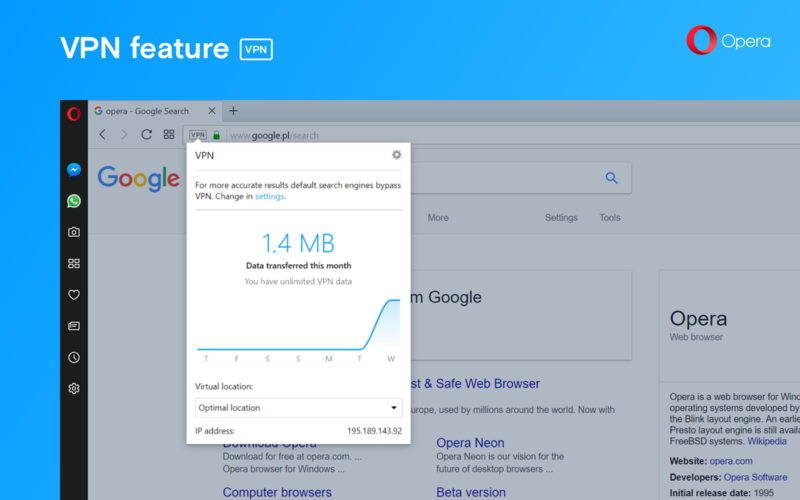 Then, the browser VPN connection will be enforced for any website, including your search engine. 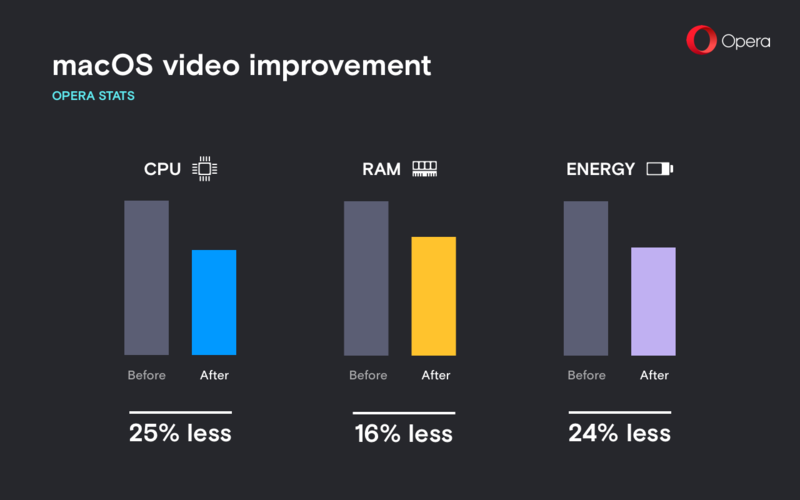 Opera 50 provides an overall better video experience on macOS with smoother playback, snappier seeking and faster loading for high resolution videos. The new solution has a positive impact on both CPU and RAM usage, as well as on power usage. The improvements are more visible when playing high resolution videos. 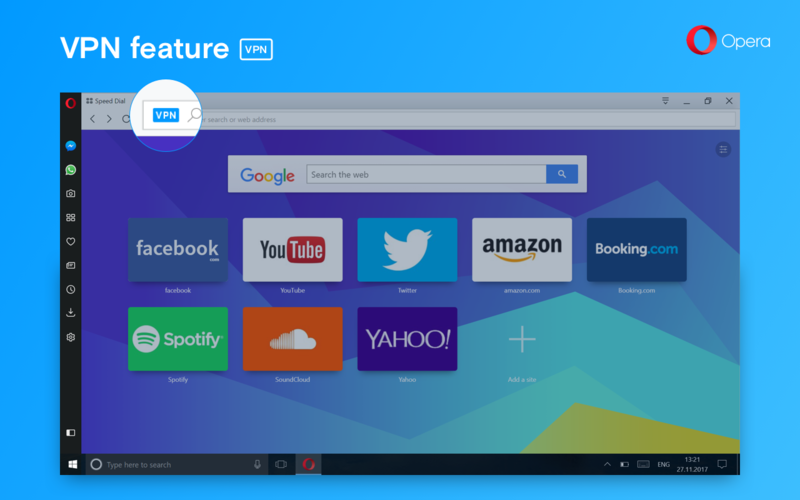 Opera 50 is powered by a fine-tuned version of Chromium 63. To learn more about the changes in the engine itself, visit dev.opera.com.